"The town of Wakefield was hit by a blizzard that began during the early afternoon hours of January 23rd, and ended in mid-morning on January 24th. Hailed as 'the worst blizzard in years' the snow reached a depth of 16 inches during the 20-hour storm. Accompanied by high winds and intense cold, the storm brought the community to a standstill. Transportation was paralyzed, schools were closed, motorists were stranded and cars were left on side roads, hampering the efforts of the plows. The only streets which remained open were the main roads, several of which were covered over shortly after being plowed, due to the winds which reached 30 to 40 miles per hour. Drifts of six to eight feet were not uncommon. The regular highway crews, using 11 trucks, were joined by approximately 300 ERA workers to clear the streets and sidewalks. The storm caused many people to be stranded in Boston or at their place of business. Charles McCarthy, owner of McCarthy's Market, and his clerk, William McKeon, found it impossible to reach their homes and were forced to remain in the store throughout the night." -- Text from calendar by Jayne M. D'Onofrio. 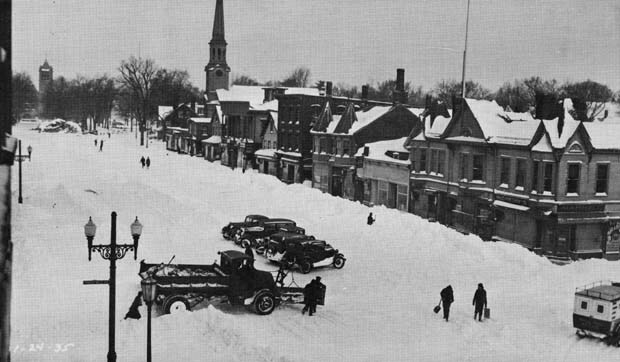 “Downtown Wakefield, January 24, 1935,” NOBLE Digital Heritage, accessed April 20, 2019, https://digitalheritage.noblenet.org/noble/items/show/6920.